Prof. Shiva Bajpai, the founding President of Dharma Civilization Foundation since its inception in 2012, is no more with us. Click here to read the obituary. 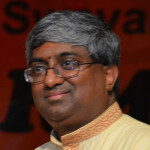 He was inspired by the opportunity of making a positive impact to the quality of academic and intellectual discourse on Hindu Dharma and the Dharma traditions of India. More importantly, he believed that Hindu Dharma had a unique contribution to make to humanity, i.e. in his own words in ‘promoting the concord among world civilizations rather than their clash’. As the newly elected President of Dharma Civilization Foundation, (DCF) I am grateful and honored by the opportunity of stepping into his shoes and steering the organization over the next phase of its evolution. DCF has been in existence for a little less than six years now, and perhaps, its most significant accomplishment has been the initiation of the Mira and Ajay Shingal Center for Dharma Studies at the Graduate Theological Union, Berkeley, California. (Click here for more about the Center). For the first time in North America, we now have an institution where a student can get a PhD in Hindu studies, where the orientation of teaching and research is more aligned with the experience and knowledge of the insiders i.e. the practitioners of the various Hindu traditions i.e. Sampradayas. At last count more than 10 students have enrolled in this PhD program at GTU. At the same time, DCF’s most public setback has been the unfortunate rejection of the Hindu Chairs by the University of California, Irvine. We welcome UCI’s letter expressing regret and continued interest, (Click here to view the letter) as a cautious opening for civil discourse and continued dialog. As we look beyond these initial successes and stumbles, our priorities will be to rededicate ourselves to the vision and mission of DCF, revitalize the organization, rejuvenate our fund-raising activities, re-engage the eco-system of stakeholders in the domain of Dharma education and target our gift giving towards carefully selected institutions, scholars, students and research. I request your blessings and your continued support, as I step in the new role.